Mita Banerjee studied American, British and Slavic Studies at Johannes Gutenberg-University Mainz between 1990 and 1996 and completed her doctoral thesis in American Studies in 1999. In 2003, she received her postdoctoral qualification in American Studies at Johannes Gutenberg-University Mainz. During her course of study, she received the prestigious Fulbright scholarship which enabled her to study in the USA. Furthermore, she was an Emmy Noether-fellow of the German Research Association and a research fellow at Berkeley University. From 2004 until 2010 she worked as C4-professor for North American Cultural Studies with focus on literature at Siegen University. 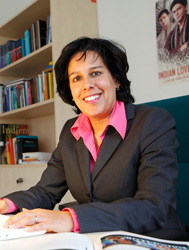 In 2010, she was appointed as W3-professor at Johannes Gutenberg-University Mainz. During the period of 2010-2015, Banerjee held a research fellowship of the Gutenberg Research College. Mita Banerjee's research aims at applying theories in the fields of postcolonial research, Critical Race Theory and Ethnic Studies to literary analyses in order to develop new readings of canonical literary texts. Her work explores the fields of life writing research, medical humanities, transnational American Studies and, thus, brings them to national and international attention. This is reflected in her international contacts and co-operations, her numerous publications in renowned journals as well as in her five monographs, most recently "Medical Humanities in American Studies: Life Writing, Narrative Medicine, and the Power of Autobiography" (2018). In 2016, she edited the anthology "Comparative Indigenous Studies" of "American Studies ‒ A Monograph Series". Mita Banerjee is a member of the Executive Board of the Obama Institute for Transnational American Studies which was founded in early 2017. Press release "German Research Foundation continues funding of the Life Sciences – Life Writing Research Training Group for an additional four and a half years"
Press release "German Research Foundation approves research unit to study extreme experiences in human life"